As I came home last night to my trashy neighbors having not one, but TWO broken down cars in their front yard (yes they are that high quality! ), I got to thinking about things I wish I had thought about when we bought our house. 1. Pay attention to your future neighbor's houses. You can tell a lot about your neighbors by the condition of their house and their front yard. The two times we looked at our house, I didn't pay any attention to what the neighbor's houses looked like. Our house is in a really good neighborhood, where every house is kept up and the yards are cared for. Except our neighbors. They are THAT house. While they didn't have broken down cars in the yard then, they did have all sorts of junk in their driveway and a half put together fence. I didn't really notice until we got possession and they came over and introduced themselves. That's when I noticed that they are a little rough country. Sure enough, in the year and a half that we have had our house, we have had to deal with all sorts of crap from them and their kids, from screaming profanity outside around our kids, to picking up trash thrown over the fence in our backyard, to the kids lighting firecrackers in our driveway during a burn ban last summer. Seriously, seriously annoying. Not only that, but the trashiness of their house will affect our house should we ever go to sell it in the future. 2. Drive by during or just after a heavy rain. We made sure our house isn't in a flood zone before we purchased it. However, the sewer system in my neighborhood is old and can't handle heavy rains well. 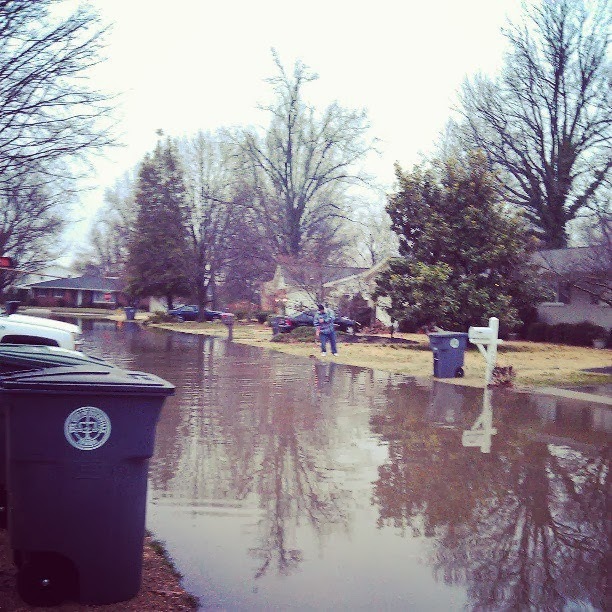 The above photo is what happens in my neighborhood almost every time we have a heavy rain. Usually, when this happens, we don't need to be somewhere or we're at work and it has subsided enough by the time we get home that while it is really annoying, it hasn't posed much of a problem. However, it was so bad once that it flooded our garage, crawl space and basement while we were on vacation this summer! Our house has beautiful landscaping and nice, large shade trees. I love plants and gardening and so I was in love with all of the flowering trees and shrubs when we viewed the house in April. However, fast forward to the summer when you're trying to take care of everything with two small children. That beautiful landscaping in the backyard? Yeah, it's all we can do to trim the shrubs and keep the weeds that have grown up cut down. And, those beautiful maple and oak shade trees in the front yard? Such a pain to rake in the fall! We had 41 bags of leaves from just the backyard...we haven't even begun to rake the front yet because that beautiful oak tree doesn't drop its leaves until mid to late-December! These are just a few things that have crossed my mind as something we should've been more cognizant about when we were looking at houses. What are some other things you have thought of when going through the home buying process? We made the same mistake when we bought our Taylor house! We dealt with trashy neighbors and HUGE oak trees with never ending leaves to rake. We close on Friday morning and I am not the least bit sad about it ;). Maybe your trashy neighbors will move out of the neighborhood in the near future. One can only hope! Oh I wish! The guy's parents live in the house behind ours and own the trashy house. So, they're never going anywhere unfortunately. We did a lot to the interior, but knew that was going to happen so it wasn't a big deal. We were willing to do the work to be able to get a bigger place in a good neighborhood for less money :-) It's the rest of it that we didn't think about! We been debating on purchasing a house lately. These are some really good tips that I never even thought of especially the "neighbor" tip. I should have thought about what would happen when it rains too...my road looks like yours after a heavy rain, maybe worse =\ ! I never would have thought about that until it happened to us! That photo is one of the better times actually. I could get to the end of my driveway. Usually it's halfway up our driveway and the side yard between us and the neighbors is flooded too. Ugh. It's so frustrating. I actually don't really like our neighbors on the other side of us either because they have five cars with a one car garage and driveway so they always wind up parking in front of our house and we have to go ask them to move their cars so our guests can park there. At least they keep their yard and house nice though! I'd also pay attention to if neighboring houses are owned or rented. We have the WT neighbors as well and about a year of us living in our house, they moved and decided to rent out. Now it's a rotating door of inhabitants, each with their own quirks and horrible habits. This is a great list. I would have never thought to drive by after a heavy rain! I know others that have run into that problem too. Our "special" neighbors' house is owned by the guy's parents so I don't think they would necessarily rotate inhabitants, unless it's family members...which might be worse! Neither would I, which is so weird because I went to college in the city where I live and the campus and surrounding areas flooded ALL the time. Now I know for next time! Those are all really awesome points! Especially the flood one, we have some suburbs in my area that flood really easily so when we start to look for a new place we're steering clear of those. So true! I'm sad not to own a house but posts like this make me grateful I have the chance to consider these things. It's just my street and one other in my neighborhood. Poor design and outdated infrastructure! I love the fact that we have our own home finally. But, there are so many things that we have to deal with now that we didn't as renters. There are definitely days when I would love to go back to that! There is a house down the street from us that is painted blue, red, green, and yellow, and has bushes so overgrown that you can't hardly even see the house! It definitely does not belong here! So frustrating!